Aggravation is a board game very similar to Parcheesi. It was first produced in the 80's, but it has been said that it is a renamed version of a game called "Wahoo" that was created 40 years ago. The game board has an asterisk-shaped pathway that can accommodate up to 6 players. The object of the game is to move your 4 marble pieces around the board from the starting point to your home base by the roll of a dice. "Aggravate" your opponents by causing their pieces to go back to their starting points or by using shortcuts found in all corners and the center of the board to get to the end of the game even faster. 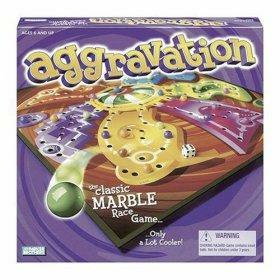 Suitable for all ages from 6 and up, Aggravation is easy to learn and fun for the whole family to play. It is not difficult to learn how to play Aggravation. Just follow the steps and guidelines below and you will be having fun in no time! Set up the game by having all participants select one of the 6 colored groups of pieces to play. Next, find out which player goes first by having everyone roll the dice. Whoever has the highest number starts the game. Play then continues to the person sitting on the left. A player starts his turn by rolling the die. In order to move around the board, you need to get your marble pieces out. To do this, you need to get a 1 or a 6. If you roll a 6, you get an extra roll, but if you get a 1, you need to wait until your next turn to move your piece. With piece(s) now moved to the starting point of the game, you proceed in a clockwise direction around the board. If a roll causes your piece to land on one occupied by an opponent, it is considered being "aggravated", and that person's piece has to go back to his corresponding base. He will then have to get his piece out again to the starting point on a future turn with a 1 or 6. You can also jump over any opponent's piece if your die roll is high enough. If a roll puts your piece onto a space where you have another piece sitting, you cannot pass or land on that spot. You are blocked. If it looks like this is going to happen, try to move another one of your pieces instead. Using shortcuts can help you play Aggravation more successfully by moving your piece closer to the home base. If you land on a "star" spot, you will be able to move along the other "star" points around the board on your next turn. When done strategically, you can exit the star spot nearest to your home base, giving you an advantage. However, if your opponent "aggravates" you before you get a chance to utilize the shortcut, you can end up at your base point, and will have to roll the die on a future turn and get a 1 or 6 to get out and start over again. There is also a "superstar" spot that can be reached with a successful die roll. After landing there, on your next turn you will need to roll a 1 to go directly to the star spot closest to your home base. To win the game: Successfully move your marble pieces into one of the 4 home base spots by an exact roll, keeping in mind that you cannot jump over any of these spots that are occupied. Once all of your pieces are in place, you win!! You now know how to play Aggravation as an individual. Why not try team or partnership play? In "partnership" play, you and your partner play on opposite sides of the board. (Any other participating partners will do the same) The rules are the same (including aggravation), except that if you or your partner finishes moving all of your pieces to your home base, play can still continue. The "finished" team member simply gives his partner an extra dice roll. The first partnership to get all of their pieces to their corresponding home base wins the game. For team play, get into groups of three's. Sit team members in alternate seats around the board. Gameplay is the same as in "partnership", except that any player that has completed the game must declare which team member their extra die roll will go to. The first team to get all of their pieces to their corresponding home wins the game. This game can get rather rowdy, but it's all in good fun. Keep your eyes on your marbles, roll the dice, and do your best to be the first player to bring all your marbles home.